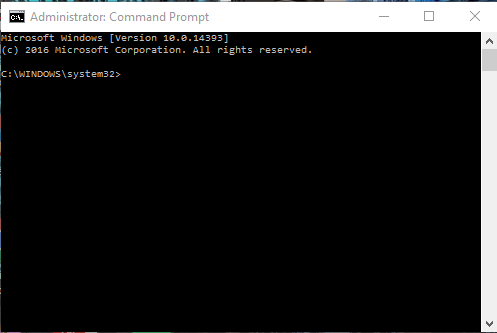 In this guide, you will learn how to use tracert and ping utilities on Windows command prompt. These commands will allow you to troubleshoot and check your connection to your website or your server via an IP address or a domain name. A computer that is running on Windows operating system. An IP address or a domain name that you want to check. 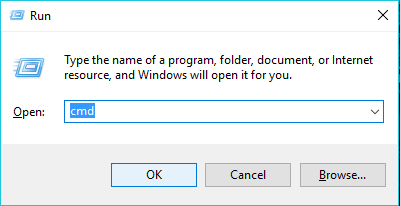 Press the Windows + R key combination in order to open the Run dialog box. Type cmd, and click OK button to continue. This will open a command prompt window. The ping command is used to test the connectivity between two machines. When troubleshooting a problem, you can use the ping command to send an ICMP echo request to a domain name or an IP address. In order to initiate the ping utility, you will need an IP address or a domain name that you want to test your connectivity to. 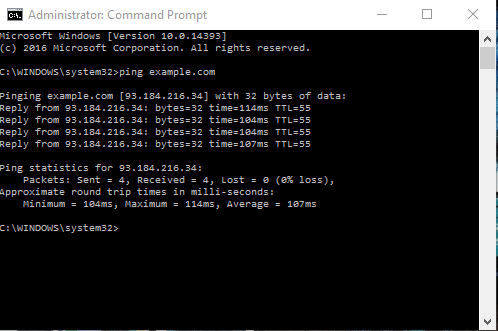 For example, simply type in ping example.com in the command prompt window and press ENTER button on your keyboard to initiate the ping utility. You will see similar results as in the window above. IMPORTANT! You must replace example.com with your correct domain name or an IP address. If you see that your ping results return a packet loss of more than 50% it means that your connection to the website is unstable and half of your packets do not reach the intended destination. 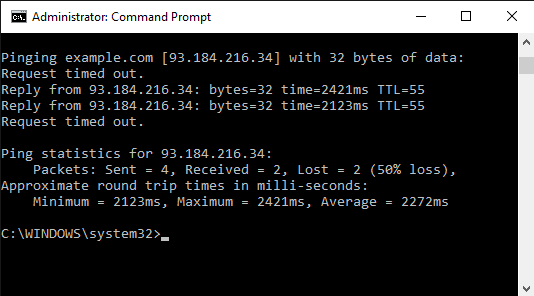 If your packet loss rate is 0% it means that your connection is perfect and packets/ from your computer reach the destination IP address correctly. 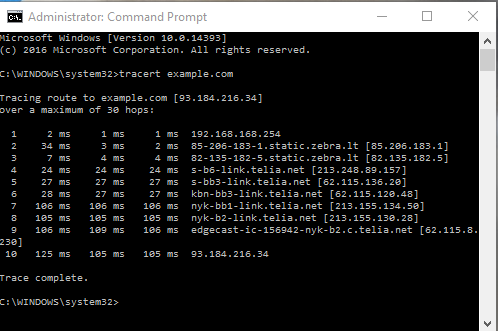 Tracert is a diagnostic utility that you can use to trace the path that the packets from your machine take to reach the intended destination, which is often a domain name or an IP address. In order to initiate the tracert utility, you will need an IP address or a domain name that you want to test your connectivity to. For example, simply type in tracert example.com in the command prompt window and press ENTER button on your keyboard to initiate the tracert utility. You will see similar results as in the window above. If you get repeated Request Time Out messages in consequent hops, that means your connection is interrupted at the hop before the Request Time Out message, and that allows you to spot where your packets are being blocked. Now you are able to use ping and tracert utilities to check your connectivity to a domain name or and IP address and troubleshoot the problems of your connection.